The California utility said it would not have enough insurance coverage if it’s found liable for the Camp fire wildfire raging in the state. California’s biggest utility was plunged into full-blown crisis Wednesday by the possibility that its equipment sparked one of the catastrophic wildfires ravaging the state. Shares of PG&E plummeted nearly 22 percent Wednesday after the company said it had exhausted its revolving credit lines, signaling it was shoring up its cash to prepare for a possible credit downgrade to junk. The utility’s filing also may have marked the start of a campaign to get bailed out by California’s lawmakers — as it was after last year’s fires. PG&E has a total of $3.46 billion in cash and cash equivalents, and an additional $1.4 billion in wildfire insurance coverage, according to a regulatory filing Tuesday. Damages from the deadly Northern California wildfire may reach as much as $15 billion, Citigroup analyst Praful Mehta wrote in a research note Wednesday. It’s the fifth consecutive day of stock declines for San Francisco-based PG&E, which has lost about half its value since the Camp fire broke out Nov. 8. California authorities are investigating PG&E equipment as a possible cause of the Camp fire, the deadliest blaze in state history, burning about 150 miles northeast of San Francisco. It has killed nearly 60 people, destroyed 130,000 acres and wiped out the town of Paradise. 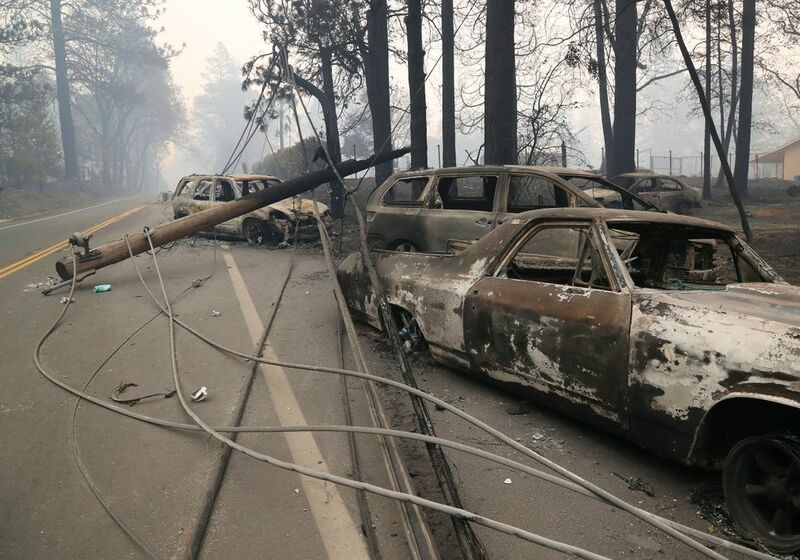 “The utility could be subject to significant liability in excess of insurance coverage,” PG&E said in its filing Tuesday. PG&E already faces up to $17.3 billion in potential liabilities for 2017’s wildfires, according to a JPMorgan Chase & Co. estimate, bringing the total to about $30 billion. That well exceeds the company’s current market value of $13.3 billion. By tapping its credit lines, the utility may be trying to improve its cash position to meet obligations that would arise if its credit rating is lowered to high yield from BBB, the second-lowest rung of investment grade, according to credit analysts. “It’s not unusual for downgrades to come fast and furiously in situations like this, so a downgrade to below investment grade is certainly a real possibility,” Gimme Credit analyst Carol Levenson said in an email. If that happens, the company would be required to post cash as collateral to guarantee contracts with providers who supply it electricity. That amounts to about $800 million, according to filings. PG&E also faces $750 million in near-term debt maturities that it will need to pay. PG&E will likely use a bankruptcy threat again as a way to get legislative aid, Gimme Credit’s Levenson said. PG&E entered bankruptcy in 2001 after incurring $9 billion in debt by buying power for more than it could charge customers. It emerged three years later. 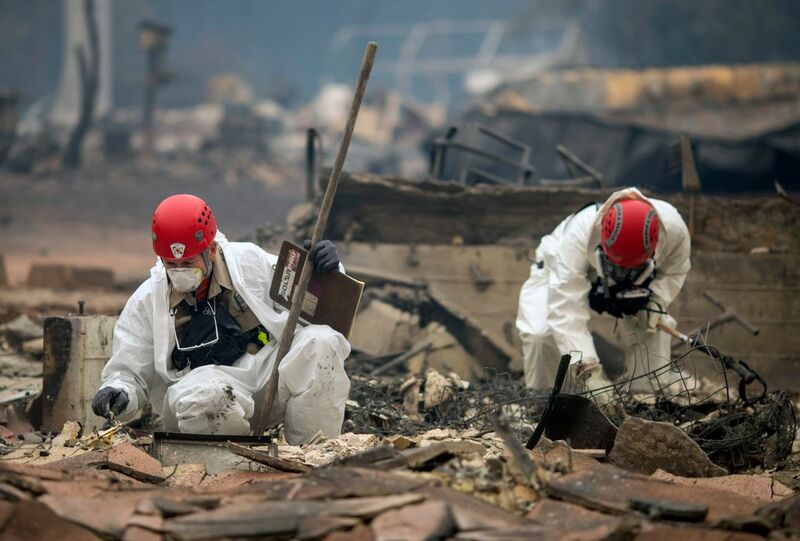 A California law passed this year, known as SB901, allowed PG&E to use state-authorized bonds to pay off lawsuits from the 2017 fires and gave utilities a mechanism for recovering some wildfire costs starting next year, so long as the fires weren’t caused by company negligence. But it didn’t specifically address how to handle the costs of any fires their equipment might trigger in 2018. The legislation also didn’t change how California applies “inverse condemnation,” a legal doctrine under which the state’s utilities can be held liable for any economic damages tied to their equipment, even if they follow all of the state’s safety rules. That’s left the utilities exposed to open-ended liabilities. Letting PG&E lapse into bankruptcy would cause problems for California beyond the wildfires, said Nicholos Venditti, portfolio manager at Thornburg Investment Management, which holds some of the utility’s municipal debt. PG&E has “fairly decent cash flow” and has taken steps in the past to avoid a bankruptcy, such as cutting dividends, he said.